I want to thank you for your great Newsletters. The information they provided was a tremendous help in forward planning of our recently completed trip. We had people scoff when we told them we planned to do the Gibb River Road & the Bungle Bungles in a Toyota Hi Ace van, but we did it. 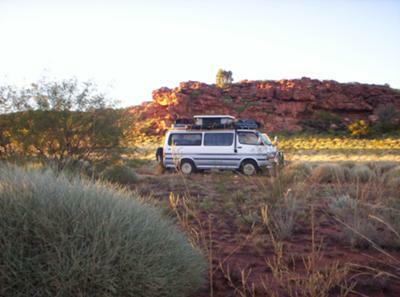 About 2 months ago, we returned from our 'Outback Adventure' (gathering inspiration for my art from the Kimberley & beyond) in what we call 'the Supervan' which is basically a Toyota Hi Ace van (admittedly it is an imported 4WD model) but with only small light truck tyres. I am a great believer in lowering tyre pressure for unsealed roads (to around 23 or 25psi and even 15psi when we got bogged in mud) and conscientiously pumping them up again for the bitumen. We travelled close to 15,000 Ks from Perth including the Gibb River Road, the Bungle Bungles and continued on to Darwin, down through the Centre, Uluru & the Olgas, the Painted Desert, Coober Pedy and the Flinders Ranges before returning across the Nullarbor back to Perth, all without one single puncture. Clearance was a bit of a problem. On exiting a creek crossing I ripped the spare wheel and frame from under the vehicle. No real problem. I fished the undamaged wheel out of the creek and used a luggage strap to hold the twisted frame in place which I had removed in Darwin. I have since decided to have the vehicle raised a bit. The only other problem was the automatic transmission over heating & I am over coming that with an aftermarket cooler being fitted before the next adventure. Rex WOODMORE Paintings in the colours of Australia. Thanks for writing and for the kind words. Go, Supervan! It's amazing where some vehicles can go, provided the driver understands the limitations of the vehicle he's driving and drives accordingly. Whenever people ask me about heading out there with less than ideal vehicles, I tell them to reduce tyre pressure and speed, and that clearance is the main issue and where they may have problems. Sounds like I can continue to stick with that advice. Glad you had such a great trip and no serious problems. Thanks for the link to your art. Watching it put a big happy smile on my face :-). I was just wondering when you travelled? We have a VW campervan, similar clearance, have travelled alot on the sand with no problem (husband reducing tyre pressure of course and driving slowly in areas required). He has been driving it for over ten years and is a mechanic and we are travelling with loads of spares/emergency equipment. We are thinking of going May/June this year and I am concerned mostly about the river crossings being too deep. Supposedly this year it had been an extremely wet season....does it dry up quickly? Reply to Kate & remember to lower your tyre pressures. I am sure May is a great time to begin your journey. (Birgit is the expert in all these things). Our adventure began in May. The creeks do dry up fast. I just came back from the Yalgoo Goldfields, which has had lots of rain and a storm that has temporally closed the Payne’s Find Tavern, but the tracks are already dry and in good shape. As for reducing tyre pressures, I was lazy on that trip and I thought it would be OK to travel a short distance slowly, without lowering tyre pressures and I staked two tyres! 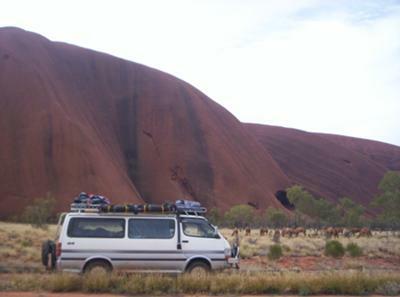 It’s funny how alongside most vehicles in the city our 4WD Hiace looks Macho, but the further we get Outback, the more everyone else’s 4WD looks Macho and our ‘Supervan’ starts to look wimpy (Perhaps there is Kryptonite in the rocks after all ?) I would love to see your VW out there. I am sure you will have a great trip. Take it easy and enjoy the journey and not just the destination. where I mention what I know of pirates in Australia. I wonder if any of your readers have any stories about treasure in the Kimberley (Apart from the whole place being a priceless natural treasure).